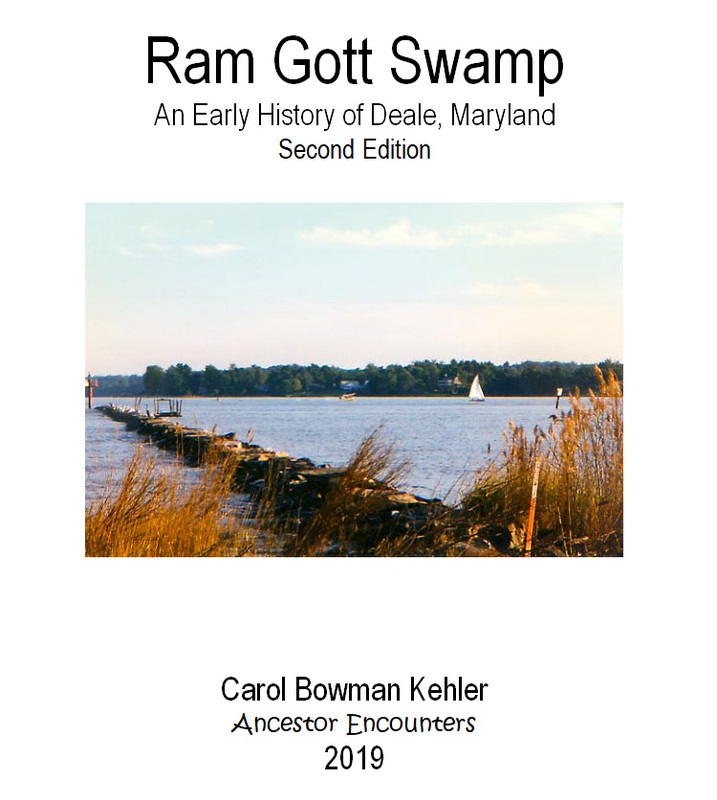 Carol Bowman Kehler is a life long summer resident of Deale, Maryland. She has worked as a high school history teacher and certified genealogist. While working on a house history of the Roberts home at Cedar Point, she collected interesting facts about the history of the area. Many thanks go to those residents who told their stories to help preserve the history of Deale. 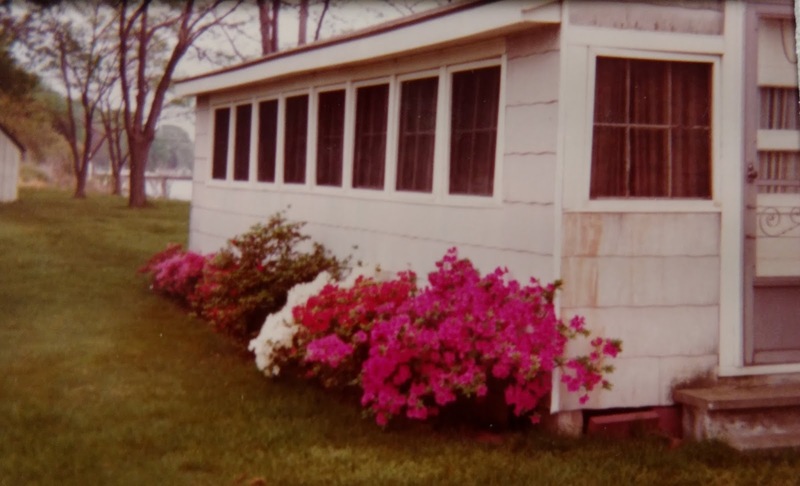 Special appreciation goes to Ella Roberts Miller and her daughter Doris Miller Bowman for many years of collecting, organizing, photographing, and remembering the history of the House at Cedar Point. They inspired us to continue learning and preserving our past. All rights reserved. No copies made without permission of the author. Copyright 2019. Ancestor Encounters is a registered trademark. On the Northern heights of Knoxville, looking down over the city and the Tennessee River, is a neighborhood called Mechanicsville tucked in between Knoxville College and the interstate. The street names and some of the buildings have changed over the years, homes razed for public parks and factories turned into parking lots, but families still sit on the front porches and call out to one another while boys play ball in the street. It was into this working class neighborhood that the Clark family moved in 1917 from Lancaster County, South Carolina. They made a new life getting work as laborers and renting a home at 300 Maria Street just a block from the Knoxville College grounds. The extended Clark family all set about the chores of daily life, joining local churches, sending the children to school, and all the adults to labor in nearby factories. They struggled together through misfortunes that would test the fabric of any family. From 1918 until 1929 at least 3 of William Clark’s grandchildren died along with his wife and daughter in law. William never owned his own home, did not have enough personal property for a probate or will when he died, and suffered much loss, but he worked hard at his various jobs and lived throughout the years putting a roof over the heads of several generations of the Clark family often living in the Maria Street house at the same time. From the Mechanicsville neighborhood, Western Ave turns south towards downtown Knoxville and then west through increasingly rural scenery. Turning west again onto Keith Road the houses move further apart and the road narrows. On the right, a pair of tumbling down pillars marks an old entranceway with no sign. A rutted, dirt road covered with oyster shells that crunch under car tires winds uphill around unkempt grounds and drooping trees through the neglected Longview cemetery. There is no record of a headstone, but one of William Clark’s grandchildren, Ruth, was buried there. She died soon after the family moved to Tennessee. The graveyard is in a quiet section of Western Knoxville across from a small tree filled park where children play on a new playground. The voices of youngsters nearby reminds us that 3 year old Ruth Clark was buried here in 1918 all alone several miles west of her neighborhood. During the decade after Ruth died, several more Clark children died as did their mother, Ola, and they were buried to the East of Knoxville in the Knoxville County Cemetery for Paupers without headstones to mark their graves. Then Grandmother, Mariah, died in 1929. The remaining Clark children looked to extended family for mentors and care while their father and grandfather continued to labor hard for their family. At the little green cabin on Soda Butte Creek the sunlight filters through swaying branches of the tall evergreens as the sparkles of sunlight bounce off fast moving currents of the creek and peek through the greenery. The bushes and trees hide chipmunks and squirrels and the tiny fawn who visits in the evenings and the mother Fox with new kits. Republic Mountain with waterfalls from melting snow can be seen to the south across the creek from the big picture window in the cabin. Inside, hanging on the wooden logs, a hand-painted wolf dreamcatcher made by my daughter guards the front door which sets the mood for this place. The photographs on the walls taken by my husband show wildlife viewed by our family over the years. There is a crackling fire in the wood stove and a small pile of the many logs that my oldest son cut when he visited in May. I cozy up to a blanket that my youngest son gave us last July when he visited. This is a family place. The tinkling chimes of the agate ovals blown by the breeze off the creek transport me to June 1980 when my husband, then boyfriend returned from a road trip to Yellowstone National Park and brought me a wind chime made of beautiful brown agate crystals. He had fallen in love with the jagged snow-covered mountain peaks and wide expanses of green sliced by rapid rivers. He treasured the smell of sagebrush as bison tramp through the blue green bushes and sounds of eagles, osprey, falcons soaring above. We next stayed at the Old Faithful Inn and viewed the geysers and mud pots. 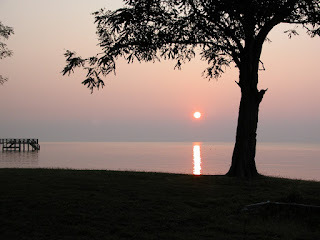 After a few days we traveled to the Lake Hotel and enjoyed sunsets over Lake Yellowstone from the porch while sipping tea. We made our way to the Lamar Valley one rainy afternoon longing to see the recently reintroduced wolf packs which stayed hidden out of sight in the sage all day. After a quick stop in the old mining town called Cooke City we headed down the switchbacks of Chief Joseph Highway towards Cody Wyoming. The snow started as night fell and the tires clung to icy roads back and forth down the mountainside as we looked out the windows over drops to the valley floor. The rustic streets of Cody were a thrill to see at the end of that perilous journey down the mountain. The next day we watched prairie dogs and bought a stuffed mythical jackalope to take home. The family trip back to Yellowstone whetted my husband's appetite for the park and by 2009 he began making annual then biannual trips to photograph wildlife. For at least 5 years he learned more about the wolf packs and logistics of finding wildlife, bought scopes and additional photography equipment, and made friendships and connections with other wolf watchers and naturalists. Eventually he purchased a walkie-talkie that enabled him to communicate with others watching wildlife and became part of a group of hard-working volunteers who educate tourists to the wildlife viewing. After years of trekking from the East Coast with an increasing amount of supplies and renting places to stay near the park, we made the family decision to purchase a vacation home to allow us to return more frequently and for longer periods of time. In May of 2014 during a visit, we looked at available real estate options and chose a small green log cabin in a community on Soda Butte Creek between Cooke City and Silver Gate. The 4th of July week we inspected the house taking time to buy furniture and supplies and in late July we returned for settlement on the cabin. We flew into Billings and stayed in Cooke City overnight and back to Red Lodge for settlement and then home at last. Unfortunately the road from Cooke City to Billings is a series of switchbacks called the Beartooth Highway going high into the mountains where even in July there were 20 foot snow banks on each side of the road and skiers can practice their craft all summer. The vistas were lovely and the road was frightening so from now on we all fly into Bozeman! We painted and cleaned and furnished, shopped and had deliveries and made the cabin our own over a wonderful week. We took breaks taking picnics into the park to see bison and pronghorn. Each year since we have added a project, one year buying a car that’s garaged near the airport and can be driven around for supplies and then down through the park to the cabin. Another year hanging shades and getting a new fridge. Each of us appreciates the wildlife and scenery. From the waterfalls at Artist Point to the confluence of Lamar River and Soda Butte Creek the vistas are breath taking. There are geothermal features at Mammoth Hot Springs and the Dragon’s cave just beyond Hayden Valley. Wild life at day break in the spring can be seen nursing newborns or hunting for food. Wolf pups go tumbling down the hillside near their den while bison calves hop in play battles, grizzly mothers climb trees with their cubs and mother badger pushes her young towards their den to avoid aggressive tourists and we capture it all on film. The fuchsia pink fire weed, the watermelon red paintbrush and the lavender lupine add spectacular color along with gold and cream wildflowers at every turn. We find moose in the willows and coyotes running through sage, beaver dams that flood the front yards of friends in Silvergate and adorable pikas hiding in rocks formations, and the bald eagles that survey Slough Creek. The drama of grizzly and wolf and coyote struggling to survive amidst herds of bison and pronghorn play out on the valley floor along the Lamar River bring us close to nature and allow us to share with each other once-in-a-lifetime moments. The family is able to come in groups to share the experience that was started so long ago in the spring of 1980 when my husband took a lonely but memorable trip and fell in love with this place. The whitewashed clapboard from the original 1850 gabled farm house forms the back wall of the enclosed porch and sags in spots punctured with nails that held photos and nautical décor. The house feels sleepy with the dark green shutters closed and windows boarded over. All the old well-loved furniture is gone except three wooden folding chairs that were used on the lawn. The first floor, flooded in 2003 by hurricane Isabel has two new doors facing East to Herring Bay and several walls of dry board spotted with white paint over new nails that were not painted after repairs. The linoleum flooring put down to cover original wood planks is dusted with leaves blown in through cracks in the pantry floor that were never repaired. Sunlight streams through slits in the shutters dappling the peeling walls. Musty smells are swirled about by stiff breeze from the north-west that bends over small bushes and gusts through locust and cedar trees. A tall Catalpa tree is in bloom with sweet smelling orchid like flowers and the beginning of bean pods. Black marks from a 2005 lightning strike mark one side. The bees buzz between the tree and nearby honeysuckle that spreads over a mound of tree limbs and debris. The purple iris that surround the brick foundation of the dairy which washed away in the hurricane have faded for the season as have the pink, red and white azaleas that hug the front porch. 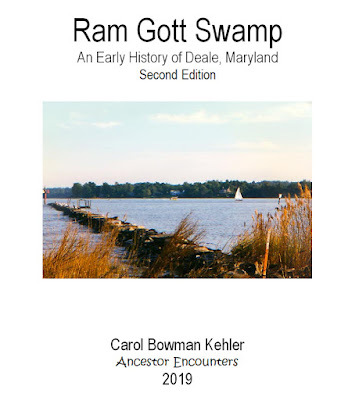 The warm winds ripple the Chesapeake Bay into frothed waves and rush the Rockhold Creek waters onto the stone jetty and old wooden pier which is pocked with rusting nails and strings of fishing line. A few new boards nailed into gaps were salvaged from debris floating at the grassy shore line. Warblers and robins flit between trees and the gabled roof with missing shingles. The large osprey nest snuggles the top of the tallest red brick crumbling chimney and the parents call warning to anyone threatening their nest. Father Osprey is sent fishing several times a day while Mother guards the collection of haphazard string and sticks she has built annually for many years. Blue heron and gulls glide across the white caps to land on the stone jetty recently rebuilt from the 1939 original construction. At the end of the jetty a red light blinks warning to the parade of boats returning to Rockhold Creek from the Bay. Wednesday nights the sailboats race on the horizon and this week the strong breezes make a rainbow of lapping sails in reds and whites and blues and yellows. The cedar tree at the edge of the house is home to cardinals and robins and humming birds. The sweet smell of the wood mixes with the honeysuckle winding up the trunk to scent the air towards sunset. The yard takes on a golden hue as shadows lengthen creating a Kodak moment photographed by four generations of women over the last 98 years. Memories of picnics and birthdays and the tug of loving faces no longer here to see the sailboats on the horizon or feel the salted air or hear the Osprey’s warning fill my heart. On a June Friday, the parade of boats from Rockhold Creek to Herring Bay signals the start of the weekend. Low tide and soft breezes all day created muddy spaces on sand bars where gulls and osprey put footprints in the sand. Swiftly about 5 pm the tide started to rise and stiff breezes whipped up white capped waves. The smells of mud/seaweed and fish began to dissipate. Clouds thickened and osprey trios found wind tunnels to circle over the waves. The next morning was the last day and the sunrise was spectacular. As I turned to leave the yard for the last time, the osprey waved. 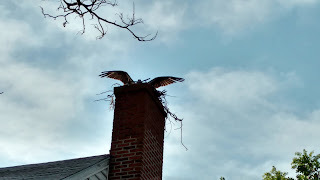 Blessings to those who come after may they treasure the baby osprey on the chimney and the bunnies under the house, the holly and cedar and the vista.